Admission Requirements:	F.Sc (Pre-medical) or Equivalent with minimum of 60% marks OR	B.Sc. (Botany, Zoology, Chemistry) along with 1st division in F.Sc. 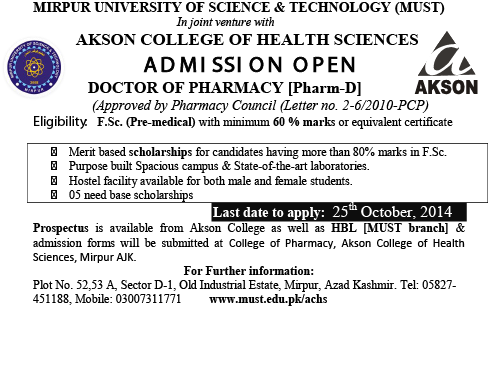 College of Pharmacy, Akson College of health Sciences (ACHS) has the unique distinction of being the first institution, imparting pharmacy studies, in Mirpur city under “Public-Private Partnership” with the Government University Mirpur University of Science & Technology (MUST). It has come to the fore-front as one of the leading pharmacy colleges of Azad and Jammu Kashmir, within a span of 4 years. Akson College of Health Sciences established its “College of Pharmacy” in 2011. Akson College of Pharmacy has made astonishing strides in the field of Pharmacy education. Our college is one of leading institute in the field of pharmacy having extremely dedicated, highly motivated, experienced and qualified faculty members. Pharmacy is a science-based health profession concerned with medicines and their use in the treatment and prevention of disease. The objective of pharmacy education at Akson College of Health science is to educate and train healthcare professionals who have the knowledge and expertise to accomplish their functions both in the health care and beyond. From this academic year it is offering a degree Program “Pharm-D”. Now the present intake is 60. College has excellent Infrastructure facilities with well designed classrooms, well equipped laboratories and well stacked library. 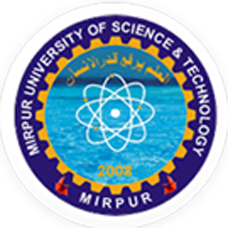 At present the college is located at old industrial estate, Sector D/1, Mirpur.